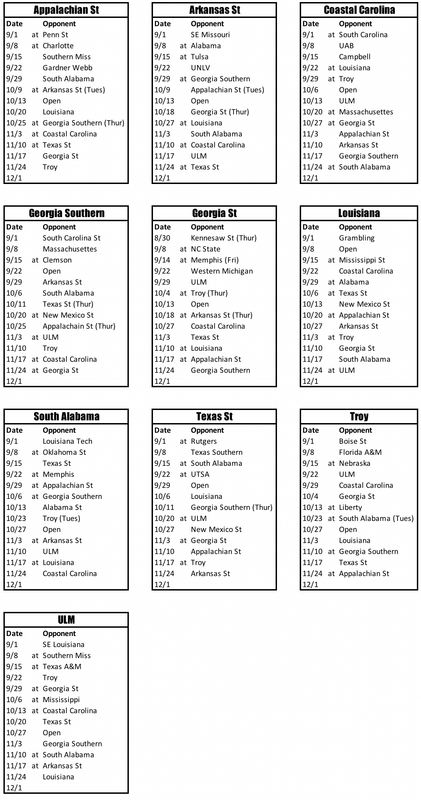 Sun Belt 2018 Football Schedules. The Sun Belt announced the release for their 2018 schedules. The 2018 season will conclude with the Sun Belt being guaranteed a minimum of five spots in postseason bowl games. The Sun Belt maintains partnerships with the R+L Carriers New Orleans Bowl, the Dollar General Bowl, the Raycom Media Camellia Bowl, the AutoNation Cure Bowl, and the NOVA Home Loans Arizona Bowl. Additionally, the College Football Playoff guarantees that a spot among the premier bowl games in college football will be given to the highest-ranked champion from the Group of Five” conferences: the Sun Belt Conference, American Athletic Conference, Mountain West Conference, Mid-American Conference and Conference USA. In the past two seasons, Sun Belt teams have won eight of 11 bowl games – a .727 winning percentage. In 2016 the Sun Belt was 4-2 in bowl games and finished 2017 with a 4-1 record.